Monogram Meredith: Did I wake up like this? Sunday night before I went to bed and was trying to write my post for yesterday, I just kind of felt stuck. 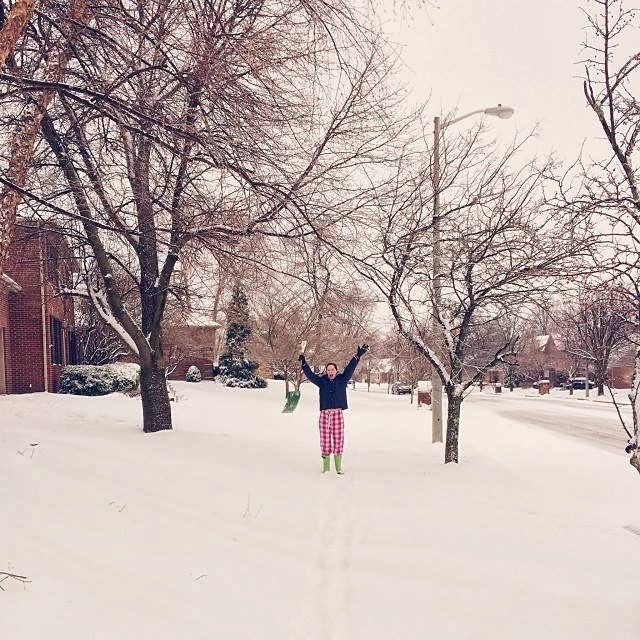 I KNOW I KNOW I have written about being stuck in a rut before, but Sunday was a lot of self questioning--- it kind of all felt like I was out of ideas for blogging. Like a few posts here and there that get hits, bam, I'm done. So many blogs/twitter accounts/instagram accounts have turned into full-fledged commercials, thirsty for free products with the bio "I SPONSOR". Like okay, we get it. And even though I'm not a blog that sponsors things a lot (or ever at this point), I had gotten kind of upset about it.... are they getting more views than my blog and that's why they're all over these sponsors and giveaways? There was I, stuck in a blogging rut and kind of upset about it, and there are people getting stuff about it. And then I read blogs from all types of people and I'm just amazed. They're out doing cool things, whether it be at a new restaurant, traveling, having experiences that I will never have, or coming up with revolutionary things to write about. They're creating style guides based on clothes they just noticed and loved while I'm still trying to get a pair of real pants on and care about trends. Maybe it's a self handicap (like Taylor writes about so eloquently), but it just kind of hit me that I am 18 years old and a senior in high school. School is blah and I'm not out doing tons of things like others are. What do I have to say? What do I have to share?! I published my post yesterday because I had had it saved when I needed a post and didn't have one and hoped that when I woke up that morning, I would have some sort of better idea of what I wanted to write about. All of yesterday was full of inspiration and a love of writing. I read Whitney's post in the morning and was just refreshed. She's a big time blogger that I look up to and her writing about her love of writing inspired me. The post was mostly about something more personal to her, but at the end, she had two perfect lines that set my mood for the whole day: "I'm just a girl with a story and a passion to write. It's a new week and this is the post that set my soul at ease." That first sentence is what I like to blog about and why I love it so much. 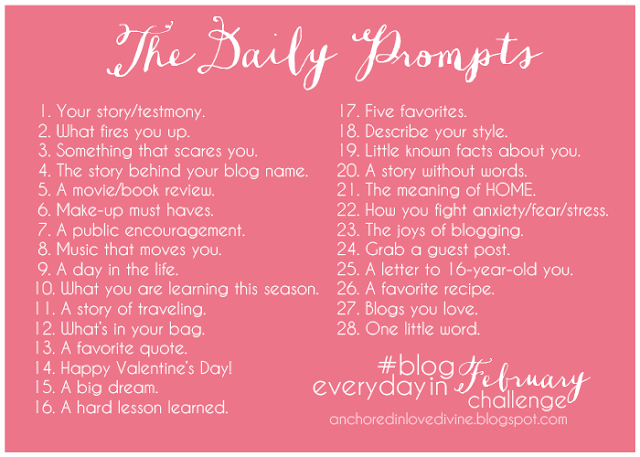 Then I was over at Sydney's blog (loooove it) and read her post with the Blog Everyday in February prompts. HELLOOOO, thank you very much. This is what I needed. I hope to have different prompts and have this as a part of my every day post (or the entirety of my post) and remember that I'm sharing my story. I'll write the answer to the prompt at the end of this post! Then, third, I waited for the highly anticipated Proper Kid Problems reveal. I love him and his blog and and his business and then..... I loved him even more. He came out of anonymity and revealed himself with the coolest posts, continually inspiring me. He's 19 years old and has made so much of himself. Now's the time for me to stop complaining about being young. PLEASE read this article and this post and just adore him with me. So..... now that I've just gone and on about people that I love and make me feel better, I guess I'll answer the prompt for today! Lol. This is kind of easy, but I love it so much. When I started my Weebly site last November, I needed a URL. I was told it could be changed and so I believed it, thinking, "My name is Meredith and I am selling monogrammed tees.... I'll call it Monogram Meredith for now and change it when I come up with something better." Yeah, I obviously didn't change it. I remember the first time someone in person called me Monogram Meredith to my face (thanks, Ryan Molten) and it kind of offended me. I was originally embarrassed by it and didn't like people calling me by it, but then I realized I was doing something powerful with the name-- I was branding myself and my business. Sometimes, I think about it being possibly unprofessional and juvenile, but I don't know of any other name I would want to change to and I don't have any reasons to. I smile each and every time I realize someone knows me solely by Monogram Meredith and not as the Mere-Mere or Scroggin that I have as nicknames because it reminds me of the work I've done for this blog. Even in college essays, the name of Monogram Meredith has meant a lot to me! So no, I didn't wake up like this, feeling refreshed, but I did feel inspired through reading posts from so many lovely bloggers! I'm so glad you're doing the challenge!! yay! it takes time, trust me! you rock though! don't forget it! Now I'm singing beyonce "I woke up like this"